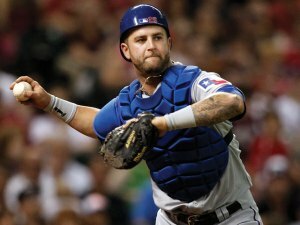 Done Deal: The Boston Red Sox wasted no time on Monday in making a deal happen with free agent catcher/first baseman Mike Napoli, as the MLB Winter Meetings kicked off in Nashville. The Sox and Napoli have agreed to a three-year contract worth a reported 39 million dollars. With the signing of Napoli, the Sox now have flexibility at both the catcher and first base positions. Napoli will most likely play first if Boston plans to keep Jarrod Saltalamacchia in the clubhouse. Should Boston trade Salty, Napoli would then likely catch with newly acquired back up catcher David Ross, and clubhouse young gun Ryan Lavarnway sharing time at the position. Nap’s Numbers: Napoli batted .227 with 24 HR and 56 RBI, he’s a career .259 hitter with 146 HR and 380 RBI. Also, Napoli should fit into the batting lineup during home games just fine, as he is a .306 hitter with 7 HR and 17 RBI in 19 games at Fenway Park lifetime. Final Thoughts: In my opinion this was a great move for the Sox as they’ve added another experienced veteran at a good price to not only help bolster the roster, but add flexibility as well. As always, I want to hear back from the fans on this one. What do you think about the Sox signing Napoli? Who should they sign next? This entry was posted in Red Sox and tagged boston red sox, David Ross, Fenway Park, jarrod saltalamacchia, Mike Napoli, MLB Off-season, MLB Winter Meetings, Nashville, ryan lavarnway, Tennessee by tsmithbsb29. Bookmark the permalink.